The Cosmetics Cop and her team are back with thousands of new product reviews, updated ingredient research, and fascinating exposés. Paula Begoun is the most unique, respected, and controversial source of skin care and makeup analysis available. 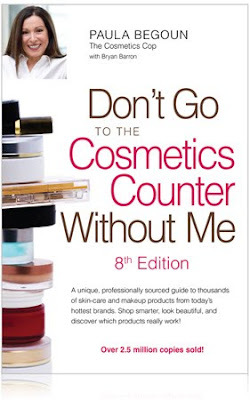 In the 8th edition of Don't Go To The Cosmetics Counter Without Me, you'll find out the benefits and failings of each product so you can easily shop for the best of the best—and get beautiful skin and makeup, regardless of your budget! Paula Begoun is the creator and innovative force behind Paula's Choice skin care and cosmetics. With 30+ years of extensive experience in the beauty industry, combined with in-depth research and study of skin and cosmetic ingredients, Paula has the knowledge and expertise to develop truly extraordinary, state-of-the-art formulations for her own line. Well-known for her extensive knowledge of the cosmetics industry, she is a respected resource amongst professionals in a variety of fields impacting the world of skin care. Over the years Paula has been and remains a consultant for dermatologists, plastic surgeons, major cosmetics companies, and industry insiders. The Cosmetics Cop Beautypedia - Expert reviews, Beautiful results.